“Our priority is to train our students to become aware of the stakes involved in companies so that they will be able to become key players in sustainable development because of their knowledge and their expertise in operational tools, on one hand, but also and above all, by their actions and behavior,” explained Regis Glorieux, the Vatel Bordeaux School Director. The EU Ecolabel certification awards hotels and motels that propose environmentally friendly products and services. 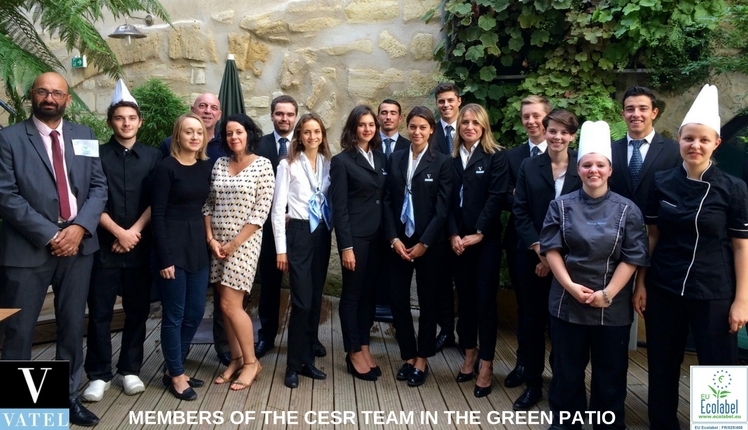 Vatel Bordeaux goes even farther and includes this ethical and ecological commitment in its entire site – the school, hotel and in the future, its restaurants – so that its higher education mission complies with a logic of corporate social responsibility (CSR). In order to train tomorrow’s managers, the directors, professors and professionals who train students during their practical application weeks are themselves trained by a professional with a contract drawn up with UMIHRA (the Union of Hospitality Professions in the Aquitaine Region). Learning also depends on less academic levers to encourage all stakeholders, including hotel guests, to take part on a daily basis, in encouraging responsible behavior and working towards a sustainable world. A multi-year EU Ecolabel action plan will be drawn up to develop Vatel’s expertise and make this an educational and skill bases model for the network of hospitality and tourism management. Vatel Bordeaux is innovating by its launch of the CESR concept: Corporate Educative Social Responsibility.